Most surveyors today are aware that data acquisition, management, analysis, presentation and controlling systems are becoming more elaborate and automated. The International Federation of Surveyors (FIG) Commission 5 – Positioning and Measurement, has been and remains an essential part of the surveying community’s growth and development. During the past two decades, Global Navigation Satellite Systems (GNSS) have and continue to play an increasingly important role in positioning and navigation. FIG enhances this development by facilitating GNSS sessions at their conferences, encouraging GNSS research and education, and cooperating with sister organisations such as the International Association of Geodesy (IAG) in the respective domain. Additionally, FIG is also trying to integrate GNSS surveying as a base and starting point for land administration as well as cadastral registration, especially in developing countries regarding property evidence. This is one of the major reasons why FIG is looking at cost-effective technologies and techniques for enabling surveyors in developing countries to use the best equipment at a reasonable price. This Technical Report is the 2nd edition of Publication No. 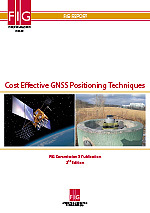 49 and builds upon the original document released in 2010 with the help of Special Study Group “Cost-Effective GNSS” within the Working Group 5.4 “GNSS”. In 2014 the Report was updated due to new technical developments. As Chair of FIG Commission 5 – Positioning and Measurement, I thank Dr. Neil Weston, National Geodetic Survey, USA and Prof. Volker Schwieger, University of Stuttgart, Germany for their efforts in compiling and updating this report.